If these new spy shots taken in southern Europe indicate what's to come, a leaner, vaguely meaner Toyota Land Cruiser appears to be in the offing. 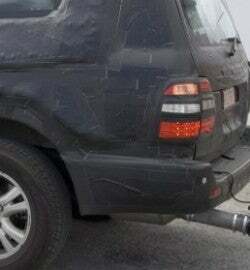 Get past the acreage of gaffer's tape and tar paper, and you can see the extent of the ToMoCo flagship SUV's facelift. Spies say the Cruiser will be entrely new with a more rounded comport, it'll get a range of engines from V6s to V8s (likely including Toyota's new 5.7-liter eight) and diesels (not for US yet) and be even more luxurious than the current bruiser. One question remains. Will it still be tough enough for the UN, Interpol and sundry warlords, drug kingpins and arms dealers? Now there's a focus group we wouldn't mind an invite to.